GIA’s Retailer Support Program makes it easy for you and your sales staff to educate consumers about the 4Cs and about diamond grading reports. GIA signage, a counter display and brochures can be ordered and delivered to your store. 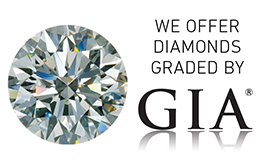 And because diamond education happens online as well as at the counter, GIA provides free videos, images, logos and interactive downloads you can use within advertising, website or social media pages. As creator of the 4Cs and the International Diamond Grading System™, a standard everyone can rely on when evaluating diamond quality, GIA provides these resources to ensure that your customers purchase diamonds and gemstones knowledgeably and confidently. We welcome your feedback about programs you value or programs we could improve upon. To do so, simply email us at retailersupport@gia.edu. Thank you! GIA encourages retailers to use these resources; however, these tools are not an endorsement of any retailer or business, and their use does not imply any affiliation or partnership with GIA.